I almost pulled the trigger on one of these, but the frame lock is keeping me from doing so. I have 2 framelock knives (a spyder and a BM) and they both have a sticky lock (if that is the correct term?). I didnt want this knife to be my #3 framelock that just sits in a drawer due to that issue. I like the idea that Lion Steel uses on the SR1 with the steel cap on the Ti framelock. I bet that removes all stickiness from the lock. That is a great idea that i wish all of these knives would adopt. Thanks for the comment man, I appreciate hearing your thoughts on this one. I’ve had several Ti Frame locks that were sticky, and it always drives me nuts – so I can definitely appreciate the apprehension. That said, I haven’t had any issues at all with this one. It’s super smooth. Haven’t heard any reports on sticking either. The geometry of this lock is a little different (hard to describe in writing but I mention it towards the end of the video). I’ve been running this one hard and it has held up really well. However, I do like the idea of a steel insert. I generally think steel on steel will wear better than titanium on steel (and I was pretty vocal about it in the Brous Silent Soldier Flipper review). 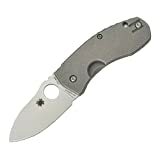 Spyderco did this with their Tuff, which is another Ti framelock released about the same time as this one. I’ve heard mixed thoughts on how people have liked that insert, but hopefully Spyderco will continue to refine it. I’ve heard that the lockface of the Ti has been carbidized. Not sure if that is true or not. But if it were true it should extend the life, reduce some wear and prevent stickiness. Not quite the same as a steel insert, but something. As a fellow lefty, I will admit that it isn’t overly lefty friendy. But I have been managing. I also wonder if cutting a small arc into the lock bar would weaken it in any significant way because it would just take a little bit to get my thumb to grab the edge of the Spydie hole. I hate the wire clip on this knife. The prototype had a really great little Ti clip that suited the knife a hell of a lot better. But it is still a superb knife that has been carried since I borrowed it from a friend. It might be a long time before he gets it back. Oh and I am with you on the back spacer. Ti would have been sweet, CF nice…even black G10 would have been better than the blue. Thanks for stopping by and leaving some thoughts. You make several excellent points. I have not taken this one apart so I am unsure as to whether they have carbidized the lockface. It wouldn’t surprise me however, given how nice and smooth this lock feels. I agree it would definitely add to the lifespan of the lock. As for the thumb hole, I pondered several design changes myself. Ultimately I felt like I wouldn’t change anything since the design is what I like so much about the knife in the first place – but yes I do wonder if a small arc would make this one easier to open. I’ve been managing, but I think it has kept me from 100% enjoying this one to the fullest. You raise some good points about the pocket clip. I noticed that was something several people on the Spyderco forum had issue with. Maybe ignorance is bliss with me since I don’t recall the clip on the prototype (I’ll have to revisit Wouter’s videos). I don’t mind the clip, but can understand how some may have issue with it. Thanks for the thoughtful comment – much appreciated! Think you could post a comparison pic of the Techno and Sage side by side? Edit – Nevermind. I watched the video and saw the comparison with the Sage 1. Derp. Glad the video helped clarify Shannon! 🙂 Photo comparisons would be nice – I need to start taking some so at the very least I have a couple on file. Thanks for reading (and watching!). The lock is carburized, not carbidized. Congratulations. This may be the most pedantic comment I have ever seen on here. Thank you for your in depth review on this micro tank. 3 and a half years later after posting this you are still helping convince people like myself to buy into the techno. I’ll get my first this week in the mail! I haven’t really heard a bad review about this knife outside of the wire clip. It was good to hear that you actually didn’t mind it. I carried a spyderfly with the same clip design and I was wary of it at the beginning but never had any of the snagging issues that I’ve heard of. Hopefully the technos clip holds up, but if it doesn’t I have a deep carry clip I could mod to make it work even better. Thank you for the kind words. I am glad the review is still of use – the knife is certainly still a great piece. The wire clip polarizes people. I happen to like it, but know that others aren’t a huge fan. It will come down to personal preference. If you like it on your Spyderfly, then I think you will like it on the Techno. It’s a nice discrete clip that gets the job done. First of all allow me to say that I agree with most of your informed comments on the Spyderco Techno. I have one serious disagreement with you and it is regarding the wire clip. I am not the only one who has had problems with the strength of the wire clip and truly believe that it is designed for sub 3 oz knives and it just is not robust enough for the Techno. If you were to do your research more extensively you would discover that Marcin’s original knife ‘The Mouse’ which the Techno is a direct copy of has a proper solid titanium clip that is worthy of the knife. Spyderco makes an excellent knock off of this custom and for less dollars, but they should of respected the original clip and that is that. I have made a titanium clip for mine and it has improved this folder immensely, as I had to ditch the wire clip due to its feeble personality. Are you this feeble that you would recommend it? Apparently so. I am all for constructive criticism, differences of opinion, and spirited discussion involving knives, but to call me “feeble” because I don’t agree with your take on the pocket clip of a folding knife is taking things a bit too far. I am guessing you truly did not mean to lodge this as a personal attack, and perhaps were having a bad day or maybe English is not your first language. With that said, I know a number of people don’t like the wire clip. That’s totally fine. There is plenty of room for a difference in opinion and I understand why people don’t like that clip. Personally, it still does not bother me. Got it, love it. One complaint, lockup is at almost 50% out of the box, should I be concerned about this? That is great Michael. I wouldn’t be concerned. You can see in the picture that mine was around 50% as well. It’s secure. Thanks for stopping by. I seem to remember hearing about a run of Technos in S30V when there was a shortage of CTS-XHP. All things equal, I personally prefer CTS-XHP as I find it a little easier to sharpen.